THE Society had their autumn excursion on Tuesday, Sept. 19th, 1899, when most of the places of historic or antiquarian interest in the Rushcliffe district were visited. A very comprehensive and interesting programme had been arranged by the indefatigable hon. secretaries, Rev. J. Standish and Mr. W. P. W. Phillimore, who had been at great pains to ensure a successful and instructive outing. A start was made from King Street, Nottingham, about 10.30 a.m., in two covered brakes. There were some forty present, including: Revs. E. M. Evans (Ilkeston), G. W. Oxenham (Whatton), H. Williams (Bleasby), and Du Boulay Hill (East Bridgford), Aid. Mellors, and Messrs. W. P. Rogers (Temple Librarian, London), J. Rogers, J. Ward, W. Stevenson (Hull), C. Brown (Newark), A. Stapleton, C. Gerring, T. M. Blagg (Newark), H. Brown, J. T. Radford, and Mrs. Standish, Miss Guildford, Miss Mellors, Mrs. F. Swire (Orston), and the secretaries. Apologies for absence were received from Lord Hawkesbury (chairman of the Council), Mr. George Fellows, J.P., Mr. Isaac Smith, Rev. H. W. Wynne-Ffoulkes, Mr. George Harrison, Mr. C. Hawley Torr, Mr. J. C. Warren, and Mr. Thorpe. The weather was threatening, and most of the party were provided with mackintoshes and umbrellas, which were unfortunately needed before the day was over. However, during the best part of the day a brisk breeze kept the rain off, and it was not until the afternoon that the change came. Soon Clifton was reached, and the first halt made. 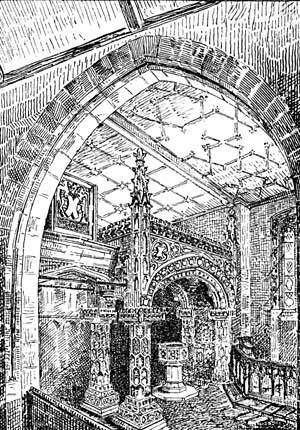 The church, a fine cruciform building with central tower, was visited under the guidance of Mr. Phillimore. The chancel is of the Perpendicular period, with a fine oak roof, and was probably erected by Robert Yole, rector, 1479-1506. The various monuments of the Clifton family in the church were described.
" To the Clifton Family a friend sincere & Constant to ye end. would you know who the Inscription tells Here lyeth ye body of GEORGE WELLS." This is dated June 16, 1712. On the monument to Sir Gervase Clifton (who died in 1587) is inscribed the motto vivit post fvnera virtvs, adopted by the Town of Nottingham. On another memorial is written "Here lieth interred the body of Joseph commonly called the Black Prince who was converted to the Christian Faith Anno Domini 1675 and died on the First day of June Anno Domini 1685 in hope of a better life." Joseph was a black servant of the Clifton family, and was supposed to have been a Prince in his own country—hence the appellation "Black Prince." There is also a bust to the much-married Sir Gervase in the church, surrounded by his wives' coats of arms as "a sort of aureole" as Mr. Phillimore suggested. There were a great many inscribed stones in the chancel, but many of them have unfortunately been obliterated. There is one of especial interest to Nottingham people—a memorial to "the Rev. Wm. Standfast, doctor of laws," who died on June 4th, 1754. Dr. Standfast was the founder of the Standfast Library, now in Bromley House. Through the kindness of Colonel and Mrs. Bruce, Clifton Hall was inspected. The host and hostess accompanied the party, and Mr. Phillimore described the various points of interest. Clifton Hall, as one would naturally expect, possesses an extensive collection of family portraits, some of which are by eminent painters. In the older part of the building are some beautifully disposed coats of arms on the ceilings, and the drawing-room contains a magnificent chimney-piece of Italian workmanship. From one of the rooms a passage was supposed to lead to the church, but if this be so it has been bricked up, as nothing of it is now known. The ceilings in several of the rooms are well worthy of inspection. Outside the house are a couple of curious old man-traps, and one or two rusty pieces of ordnance. Before leaving, the excursionists accorded Colonel Bruce a hearty vote of thanks, and this the Colonel very kindly acknowledged. He had with him his favourite monkey, Jacko, a comical element in the visit which could hardly escape notice. The next place visited was Gotham Church, whose title to distinction lies in its monuments of the St. Andrews family, a cadet branch of the ancient de Quinceys, Earls of Winchester. The Rev. C. S. Millard, of Costock, in the absence of the rector of the parish, pointed out the different monuments and histories attaching thereto. The church itself is a very ancient building, being of the Early English period. It has been most sadly pulled about by amateurs in architecture, and, as Mr. Millard regretfully remarked, there is scarcely any portion of the old church visible that is not covered with stucco. Mr. Millard related a number of interesting circumstances connected with the St. Andrews family, who, taking their name from a town in Scotland, whence they had migrated, were lords of the parish from 1210 to 1625. The unhappy energy of so-called church restorers has not stopped at the building itself, but has, sad to relate, extended to these ancient monuments, which have been painted a hideous drab. There are some fine specimens of heraldic work on the walls. While the visitors were exploring the church, the Rev. E. M. Evans played one or two selections on the organ, and then an adjournment was made to the adjoining school-room, where luncheon was waiting. No body of excursionists would think of visiting Gotham without referring in some shape or form to the time honoured legends relating to the wise men of that village, so at the conclusion of luncheon Mr. A. Stapleton gave a short but interesting account of some of these fables. 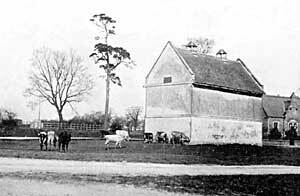 Mr. Stapleton then proceeded to refer to the folk-moot of the wapentake—the meeting place of the Hundred of Rushcliffe, a gathering spot for some score parishes comprising thirty townships. 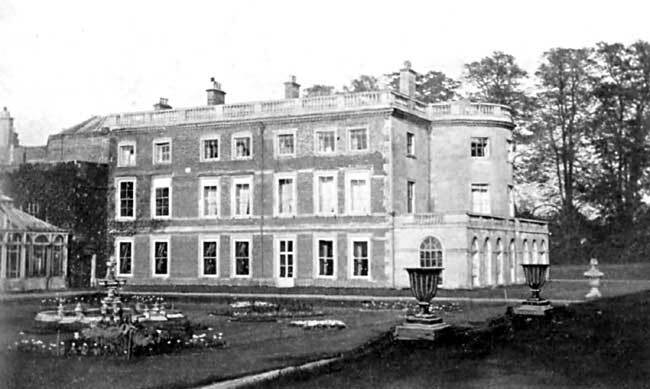 The enclosure is now traditionally known in the locality as the site of Rushcliffe Hall, though there is neither sign nor probability of any substantial building ever having been erected thereon. After luncheon a visit was paid to the Cuckoo Bush and the Moot Pit at Court-hill, a tumulus covered with ivy, and supposed to be an ancient British burying-place. Kingston-on-Soar Church was the next stopping-place. The beautiful monument of the Babington family, however, could not be properly examined owing to the extension which is being made to the church by Lord Belper, and only a brief stay was made. The church itself is a specimen of the latest Gothic architecture in the county, and is, from the exterior, one of great beauty. A very instructive time was spent at Radcliffe-on-Soar, where the church is noted for the monuments of the Sacheverell family. The tower dates from about 1200. In the Sacheverell Chapel are buried the members of that family, and there are some very fine monuments. The whole of the floor of the church was originally covered with monumental slabs, but these have now been almost entirely obliterated. In this church, too, there is what is supposed to be an Easter Sepulchre of stone. These Easter Sepulchres were usually made of wood elaborately carved. The two principal stone ones are at Hawton and at Heckington, near Sleaford. Those, too, are elaborately carved with figures of soldiers guarding the tomb. In Radcliffe there are no such figures, and it is more likely the supposed Easter Sepulchre is a founders' tomb. There are three altars in the church, the one in the principal position being the original one of stone, with Christian symbols on it. At Thrumpton Hall, the beautiful Jacobean residence of the Rev. P. H. Douglas and Lady Byron, the party were cordially received by Mr. Douglas, who acted as guide. The fine staircase—said to be the finest in the three counties— occupied some attention, as did the mouldings over a great many of the doors, executed in similar work. The woodwork is not of oak, though it has that appearance. It dates from a little before the best—or Gibbon—period, being a trifle too florid in style. One was surprised to notice on the walls a painting of Oliver Cromwell. It seems that Mr. Pigott of that time, to whom the residence belonged, was a member of Cromwell's Parliament. Mr. Douglas told the party, too, that he had in his possession a letter from Cromwell to this Pigott "ordering" him to represent Nottingham in Parliament. 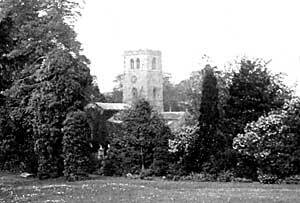 The church at Thrumpton, at one time a chapelry to Radcliffe-on-Soar, was paid a visit. Most of the monuments in this church are of the Pigott, Emmerton, and Wescomb families. Barton-in-Fabis was the next and last stop, and the first thing done on arriving there was to dispose of a good tea. This done, some of the party inspected the church by lamplight, after which all was made snug for the return journey, and Nottingham was reached about 8.30. It was intended to visit several other places, but time and weather prevented. Before the party dispersed a vote of thanks was passed to the honorary secretaries, on whom all the work of the excursion had devolved.